As if Oreos weren’t already your favorite cookie, they had to go and launch two more fruity flavors that’ll have you falling absolutely head over heels in love with the things. If you thought it was hard for two chocolate wafers filled with cream to get any better, well, clearly you weren’t thinking quite like these cookie-makers. The creative Oreo geniuses are showing us just how limitless this dessert really is. Why stop at chocolate when you could have Blueberry Pie and Fruity Crisp flavored goodness just as easily? Good thinking Nabisco, good thinking. Two graham cracker-flavored cookies and blueberry cream comprise the Blueberry Pie flavor while the Fruity Crisp version is made up of the original cream filled with cereal sprinkles, much like your favorite breakfast treat, Fruity Pebbles. Is your mouth watering or what? According to PopSugar, you won’t have to wait long to give these flavors a test-run. 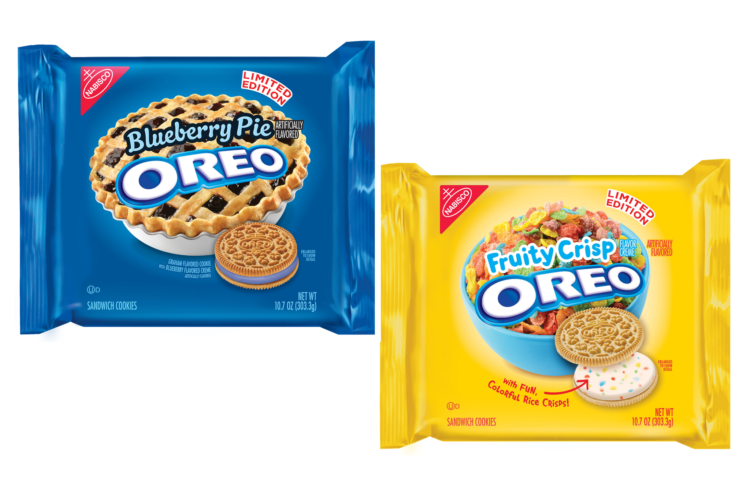 The Blueberry Pie version comes to Target on June 6, but the Fruity Crisp Oreos will be available in stores as soon as June 1. So, get ready to have a new favorite cookie because these new versions of an old favorite surely won’t disappoint. All you’ll need next is a glass of milk. Because is there any other way to enjoy an Oreo?